You haven't told us how you kept your sanity and your cool throughout all this. I am quite certain I would have lost it by now if I had spent all that money and ended up with this pile of dangerous rubbish. The lesson for me is that it could be better to buy stand-alone equipment that doesn't attempt to talk to any other equipment. My current boat has just a Raymarine C80 Plotter with radar overlay and a back-up Furuno GPS. They don't have to talk to each other; they are independent devices. Anyway, I wish you luck with the next stage. I have enjoyed reading your blog from start to finish. It almost reads like fiction where there is always something about to happen around the next corner - a real real page turner :-). I appreciate your in depth technical descriptions. I wasn't aware that there is both a relative and true mode for the motion vectors using MARPA targets. I have used NN3D True vectors quite a bit to look for potential collision course vessels. The newly acquired targets always seem to start off pointing the wrong way, but eventually straighten out to a stable path at least with NN3D. Thanks for the compliments, and glad you are enjoying the blog. I didn't know about relative and true motion vectors either. 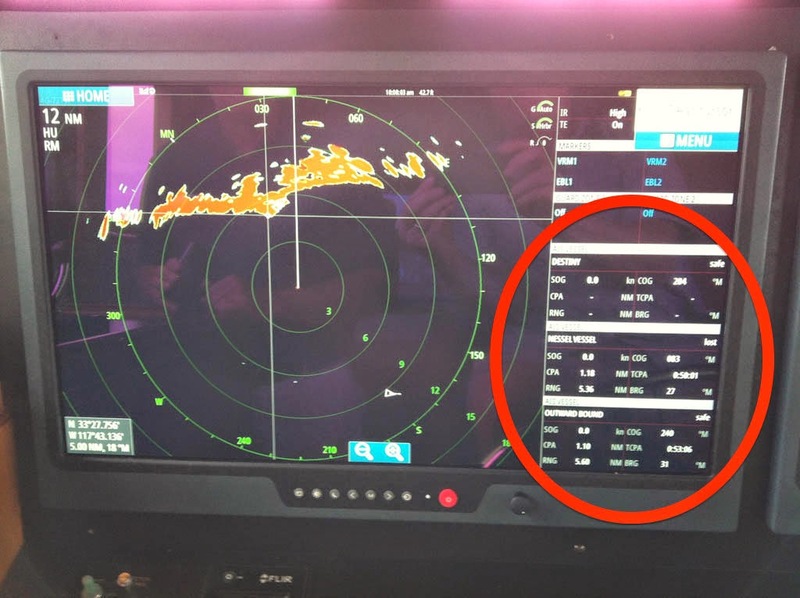 But when the ARPA vectors on the Simrad radar were so whackey, I started reading everything I could find and came across relative vs true motion vectors. 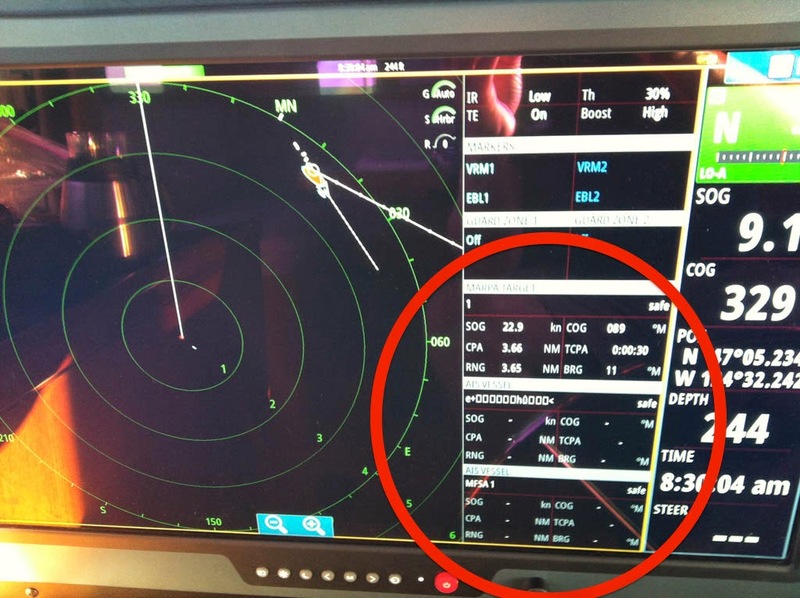 For a while I thought that explained why the Simrad vectors generally point off at an angle different from the AIS vectors, but that turned out not to be the case. And it certainly didn't explain the vectors swinging around. I noticed the problem initially because of my experience with the Furuno NN3D radar, which is just like yours. While it's acquiring the target it will be unstable, but once acquired it tracks really well. For a while I thought maybe I was miss-remembering how the Furuno radar worked, but then got back on my Grand Banks to take it up to Maine for the winter, and it worked just as I remembered. In the next week or two I'll have the new radar operational and will take a few videos to show how radar is supposed to work. - The GB is a planing hull where the N60 is a displacement hull. On teh planing hull the bow rises as you go faster, where the displacement remains level at all speeds. The resulting interior comfort while underway goes hands down to the N60. - Both boats are stabilized, so roll is almost non-existant on both. - Heading into waves, their size and approach speed are key. The approach speed is a function of the wave's own time period, plus you speed and angle making way into them. If you are head into them you will have the fastest closing speed, and the more of an angle at which you approach, the lower the closing speed. Long, slow swells are not uncomfortable at all. Where things get uncomfortable is when the boat is going up and down rapidly, and that's a function of how frequently you encounter each wave, and how tall the wave is. One rule of thumb is to avoid waves where the time interval and wave height are the same. If the interval is lots longer than the wave height then you aren't getting thrashed around as much. This is a really long way to get around to my point. With a faster boat you have more choices in how quickly you close on the waves. I have found many situations where going a bit faster turns an uncomfortable up and down motion into a more comfortable bump bump bump as you more quickly bridge each trough and cut into the top on the next crest. But overall we prefer the ride of the full displacement boat. I think I saw mention on a trawler forum about building a Nordhavn and a link to your blog from there. I don't remember what I was searching when I found that link, probably something about Nordhavns. Nice talking to you today. It is good to see an N60 in person. The extra cockpit area is really nice and the extra overall length seems to give the boat a more streamlined look.